The "Leipzig Aerosol Cloud Interaction Simulator" (LACIS, Stratmann et al. (2004), Hartmann et al. (2011)) is a multi-purpose instrument for investigating atmospherically relevant interactions between aerosol particles and cloud droplets under weel-defined laboratory conditions. Investigations at LACIS aim at fundamental process understanding and are complementary to field measurements. Topics which have been dealt with up to now are aerosol particle hygroscopic growth, cloud droplet activation and cloud droplet heterogenoeus freezing. 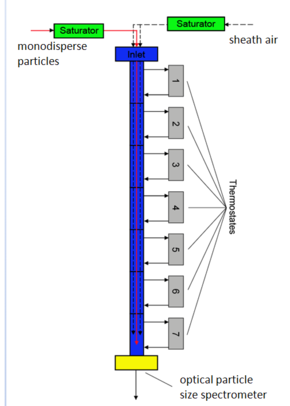 Topics envisioned for future applications are uptake processes on ice particles. LACIS itself is a vertically oriented laminar flow tube. For particle detection, self built optical particle sizers are installed at its outlet (Kiselev et al. (2005) and Clauss et al. (2013) for measurements above and below 0°C, respectively). Monodisperse particles are inserted into LACIS such that they are confined to the center line, surrounded by sheath air. Temperatures and humidities of aerosol and sheath air flows as well as the wall temperatures are thoroughly controlled. In LACIS, RHs up to above 99% can be adjusted, and particle hygroscopic growth for the respective RHs can be determined. Alternatively, conditions can be such that super-saturation occurs, which then enables the examination of particle activation to cloud droplets. For some experiments, LACIS is used in combination with a CCNc (Cloud Condensatin Nuclei counter). Sometimes, also a HTDMA (Hygroscopicity Tandem Differential Mobility Analyzer) is used to complete the dataset. For examinations on immersion freezing, the 7m long version of LACIS is used (see sketch). Particles are activated to cloud droplets, first, and are then cooled down. The fraction of frozen droplets is determined at the outlet by measuring cross-polarized light (Clauss et al. (2013)).